It has been 25 years since a major Hollywood production with a mostly Asian cast has hit the big screen in a big way. Well, move over The Joy Luck Club, here comes Warner Brothers Films’ Crazy Rich Asians, a romantic comedy/drama based on Kevin Kwan’s bestseller and featuring plenty of powerhouse actors who are mostly Asians of varying provenance that includes China, the USA, the UK, and Malaysia. 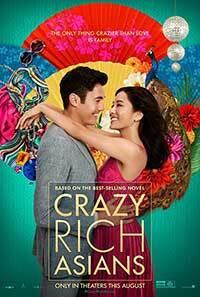 The film kicks off in the Big Apple as local university economics professor Rachel Chu (Constance Wu) is enjoying a passionate relationship with handsome Malaysian Nick Young (Henry Golding). Rachel’s background is quite modest: her mother Kerry (Tan Keng Hua) is a single parent who emigrated from China after Rachel was born and has worked hard to make a decent living for her only child. In contrast, Nick comes from the wealthiest family in Singapore although he has carefully concealed this fact from Rachel. He invites her to travel with him to Singapore for a wedding in which he will be the best man for childhood buddy Colin Khoo (Chris Pang) who is marrying super-wealthy Arimanta Lee (Sonoya Mizuno). Oh, and by the way, Rachel will finally get to meet Nick’s family and reconnect with her college classmate Peig Lin (Awkwafina). 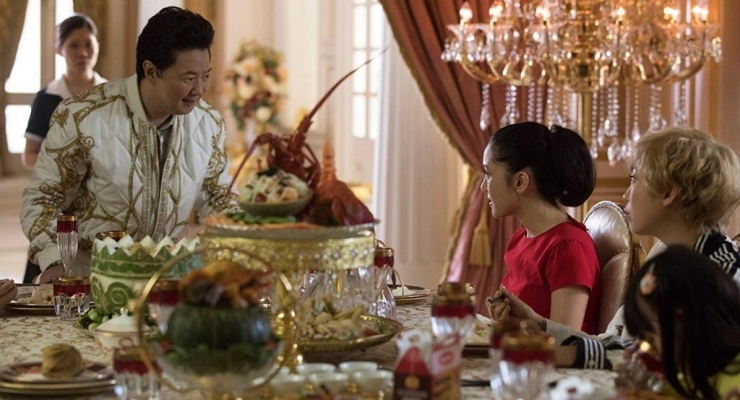 After arriving in Singapore, Peig Lin’s wealthy but eccentric father Wye Mun (Ken Jeong) and mother Neena (Koh Chien Mun) do their best to make Rachel feel welcome but Nick’s tradition-bound and intimidating mother Eleanor (Michelle Yeoh) and grandmother Shang Su Yi (Lisa Lu) quickly draw the lines in the sand. Over-the-top bachelor and bachelorette parties ensue on chartered boats and private islands while Nick confides to Colin that he plans to pop the question to Rachel after the gala wedding is over. During a private moment with Eleanor, Rachel realizes that Nick’s family will never approve of her marrying the love of her life, and she must make some difficult choices: does she accept his proposal anyway and watch him cut ties with his family and its fortune or does she simply return to her daily routine in New York City? In the spirit of “the course of true love never did run smooth,” the audience should have little doubt that this modern-day Cinderella will end up with her Prince Charming even if they must overcome a few obstacles placed in their path. A terrific script by Peter Chiarelli and Adele Lim for Crazy Rich Asians and talented director Jon M. Chu’s knowing hand are complemented by stunning shots of Singapore’s striking locations. Brian Tyler offers up a romantic score, laced with contemporary Chinese versions of American standards, that adds just the right sentiments to each of this film’s “magic” moments. What will bowl over most audiences are the massive party scenes that ooze mega bucks and are visually just plain awesome to behold. All of this would be of little value if it were not for a cast that is simply superb. Michelle Yeoh is stunning in her portrayal of a strong woman beholden to family duty in sharp contrast to Constance Wu who plays a starry-eyed romantic that finds an inner strength that she did not know she had. The numerous supporting roles are major pluses with kudos to Nico Santos’s effete fashionista, Ronny Chieng’s appearance-is-everything cousin, Gemma Chan as the luminous cousin Astrid, and the irrepressible scene-stealer Awkwafina. Crazy Rich Asians is one joyride from curtain up to finale and will have you laughing in the aisles one moment and reaching for your hankie the next. There will always be the “politically correct” critics who harp on the stereotypes portrayed by numerous characters but, you know, films are not always meant to be “PC” but rather are meant to entertain their audiences. The entertainment factor here is very high so damn the naysayers. Highly recommended.